This program encourages and creates a safe learning environment that promotes growth and holistic development for all children through play based activities. Our primary goal is to enhance the overall development of your child to promote the retention of Aboriginal Culture and Language. The daycare will have well defined play areas and structured routines. This will be accomplished based on our vision and mission statement which include the Seven Grandfather teachings and the teachings of the Medicine Wheel. The funds provided for the development of the Little Lambs program were provided through the province’s Best Start Initiative. Best Start is Ontario’s strategy to expand quality and affordable child care and invest in children’s healthy early development. 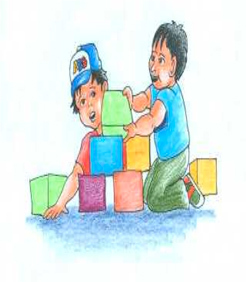 The daycare offers full day child care services to children 0 to 12 years of age. We also provide before and after school care for the children attending school full days. Programming is available to School Age Children (SAC) during the summer months.